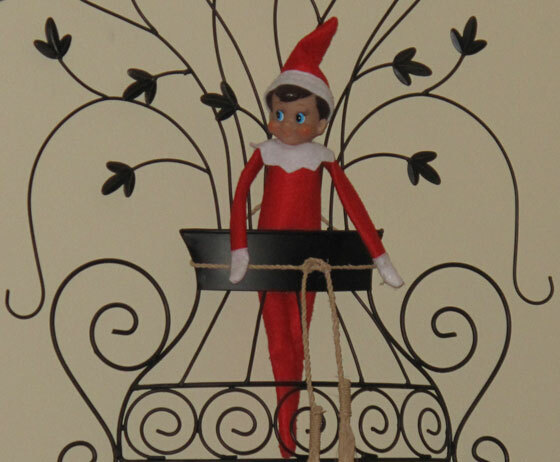 Elfie, our Elf on the Shelf, showed up in Grammy's wall hanging the day after Thanksgiving. If you haven’t figured it out. I’m talking about Elf on the Shelf . The rules are simple. Your elf flies back to the North Pole each night to give Santa a progress note. He keeps track of bad behavior and gives credit for being good. You can’t touch your elf, though, because he will lose his magic. You can talk to your elf, but he can’t talk to you. The concept is genius. Kids gets excited each morning to find out where their elf has landed. Sometimes, of course, our Elfie gets a little lazy and goes right back to the same spot he was the previous day. Nonetheless, it’s a fun time and beats feeding the boys candy every day for the 25 days leading up to Christmas. Inevitably, we forget about our advent calendar and have to backtrack, leaving us with more candy than we can handle. Elf on the Shelf is way more fun, and it gets the kids to think about their behavior. Genius, I tell you. Elfie flies back to Santa once Christmas arrives and spends the rest of the year in the North Pole. Or maybe he goes on vacation. I’m not sure about that part. Do you have an Elf on the Shelf? What’s his or her name?